Foods high in added fructose include sauces, salad dressings, sugary drinks, colas, yogurt, baked goods, and fast foods. Foods naturally rich in fructose include honey, molasses, agave, dried fruits, fruits, and fruit juices. (3) Below are the top 10 foods highest in fructose. For even more, see the extended list fructose rich foods. See all drinks high in fructose. See all fruits high in fructose. 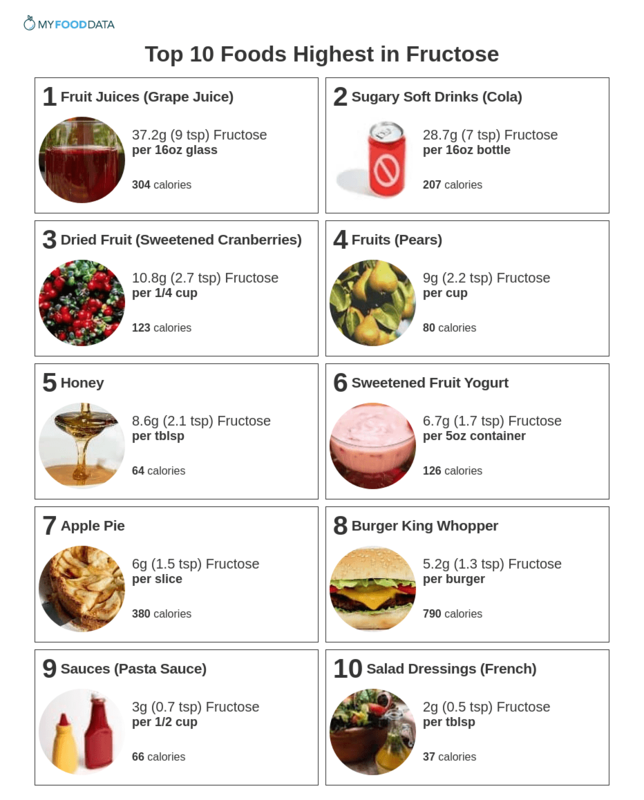 See all Fast Foods High in Fructose. See all soups and sauces high in fructose. The amount of fructose in salad dressings will depend on the amount of high fructose corn syrup (HFCS) used, or if another fruit based sweetener is used.